Population one, only one superior! 1909-11 T206 Ty Cobb Portrait Red Background with Ty Cobb Back (Lucky 7 Find) PSA VG+ 3.5. Soon after his Detroit Tigers fell to the Pittsburgh Pirates in the 1909 World Series, the only meeting between these two Dead Ball era legends, Cobb lamented of Honus Wagner, "That god damned Dutchman is the only man in the game I can't scare." It was around that time that two of the most famous baseball cards in the collecting hobby were born, each a member of the fabled T206 set that has fascinated hobbyists for a century and beyond. Today, over one hundred years after Cobb and Wagner battled for supremacy in the sixth edition of the Fall Classic, their rivalry continues. While there's little dispute that the Wagner T206 inhabits the throne as king of the card collecting world, the presented Cobb variety makes the Dutchman seem downright common by comparison. Though the red background portrait is the most plentiful of the four Cobb variants within the set, it is the extraordinarily scarce "Ty Cobb, King of the Smoking Tobacco World" advertising back that elevates the presented specimen into the most rarified of collecting air. The prominent position of these two inaugural class Hall of Famers atop the T206 endangered species list results from very limited original print runs, though the reasons for the shortages differ. The most popular theory for Wagner, perhaps tainted by folklore, is that the superstar shortstop believed tobacco cards effectively encouraged children to smoke and as such he wished to play no role. Inability to come to a contractual agreement over use of his likeness is the more likely reason for the quick removal of Wagner from the set. The scarcity of Cobb with a Cobb back, however, has a simpler explanation. Cards featuring the rare back we find here were included only within tins of Ty Cobb brand smoking tobacco, a product enjoying just a fraction of the distribution of such titans of the industry as Piedmont, Sweet Caporal and Old Mill. The PSA slab identifies this important rarity as having derived from "The Lucky 7 Find," a small but historic archive of early cardboard unearthed in a rural southern town by a family tending to the clearance of deceased relatives' belongings from their home in early 2016. These seven cards each celebrated the long-reigning Hit King, and represent the most significant trading card discovery since Heritage Auctions presented The Black Swamp Find to the hobby in 2012. The special pedigree further augments both its exclusive rarity and, by extension, its monetary value. Today it is estimated that just over twenty examples of the Cobb with Cobb back exist in the world, compared with fifty to seventy-five Wagners from the T206 set. Seventeen appear within the PSA population chart, with this being the sole inhabitant at this grade level. Just one, at VG-EX 4, is superior. 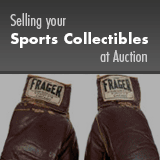 Only 31 days left to consign to the 2019 July 18 - 19 Summer Sports Card Catalog Auction !